Suddenly moving across the country can quickly teach someone the little things of a city that you can take for granted. 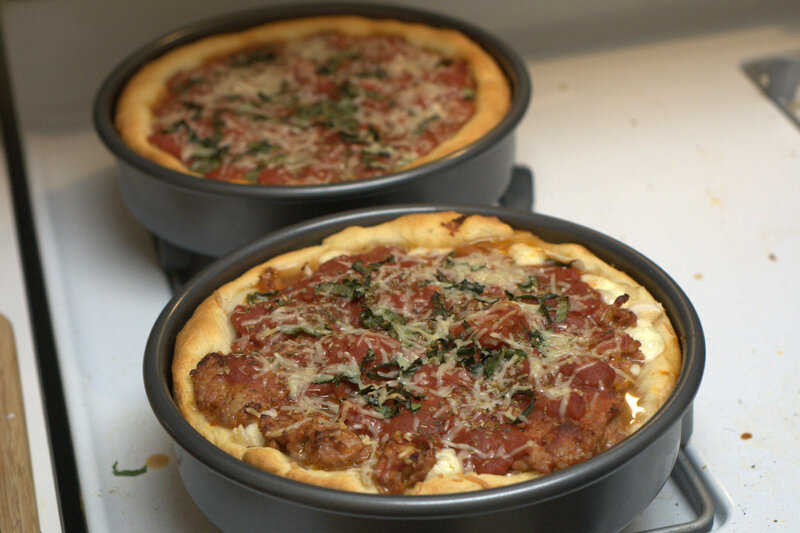 While I can’t say we miss the frozen months served up during Chicago winters, Jerry and I agree that few things are more effective at fighting off Lake Michigan’s gusts of liquid nitrogen than a helping of Deep Dish Pizza. To celebrate this amazing food in the Bay Area, Jerry and I decided to take matters into our own hands (restaurants that serve this are few and far). After sitting in the refrigerator overnight, I was glad it did not decide to crawl all the way out of my bowl and walk away. 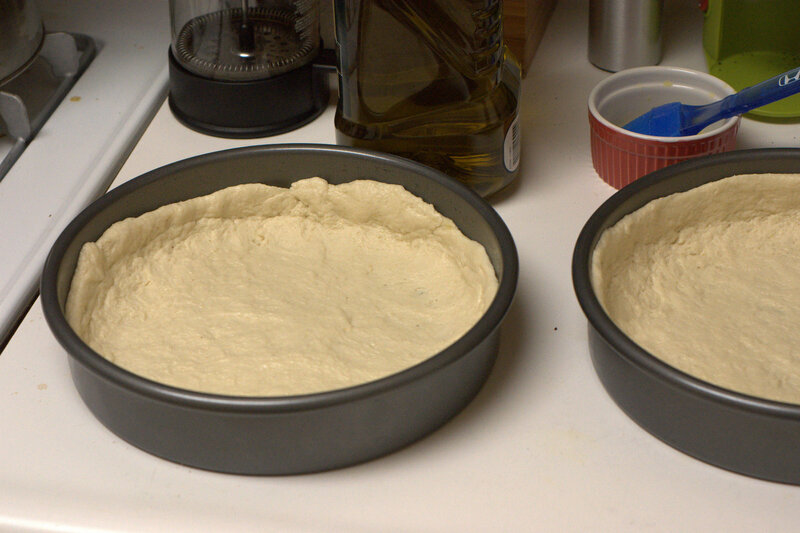 The following evening we divided the dough in half, and placed them in well-greased 9″ cake pans and set to work of working the dough out from the center of the pans all the way to the edges. 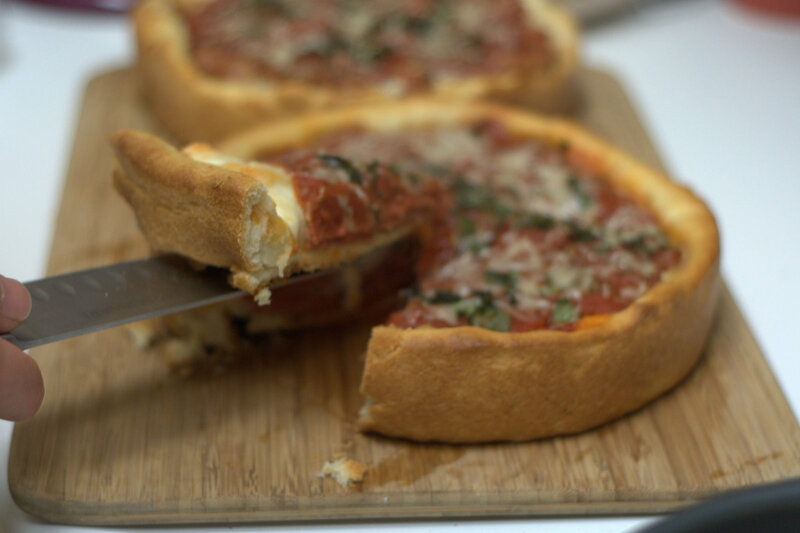 Working with a pan can be much easier than traditional disc crust. 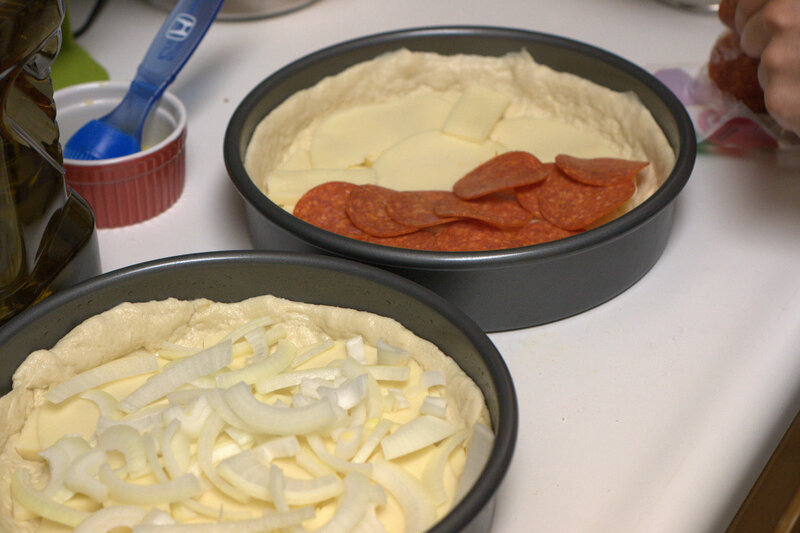 A lot less detail (and skill) is required to get proper coverage in order to set the stage for the toppings. 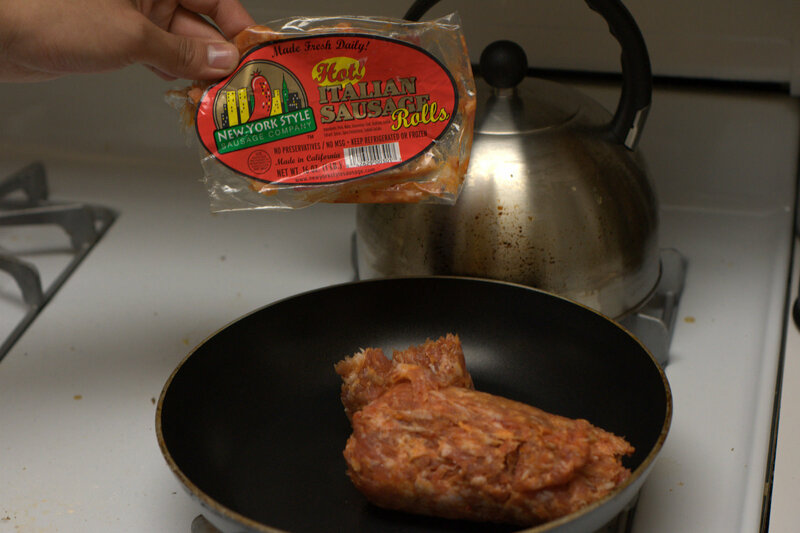 Remember, a pizza will only be as good as the ingredients you put into it! For ours, Jerry layered some freshly sliced mozzerlla and provolone, while I browned the spicy Italian sausage with some onions. 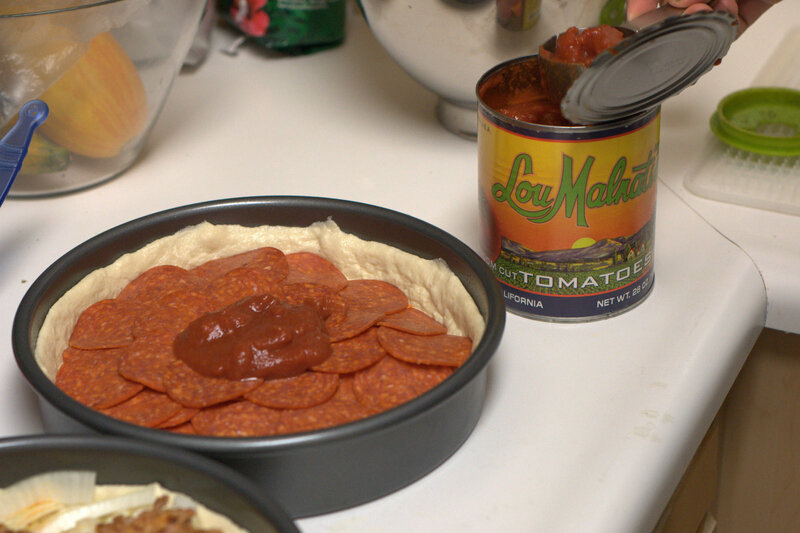 Jerry made the pilgrimage to Chicago for some famous Lou Malnati’s sauce (with tomatoes from California, ha!). Finishing the pizza was as simple as covering the cheese/toppings with sauce, and sprinkle with some fresh basil and Parmesan, and the pies were ready for baking. 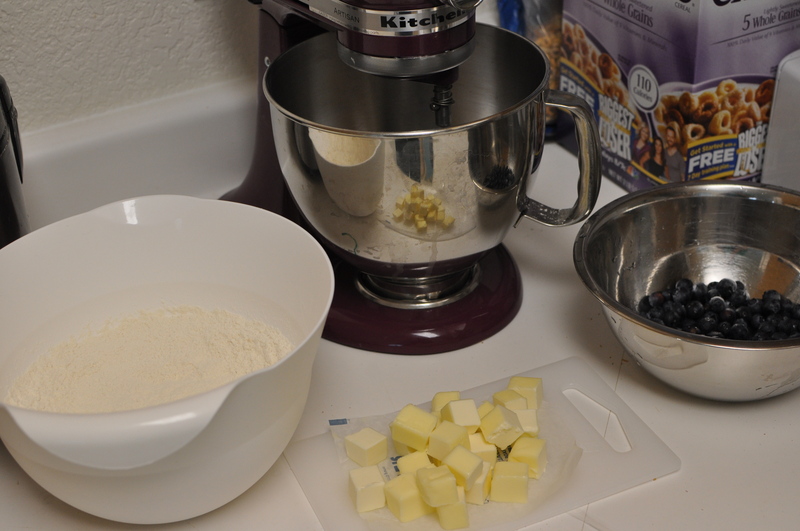 With the ingredients all assembled, we were set to go. Using the zest from a single large lemon and almost 2 cups of heavy cream, the mixture was brought to a boil then let to cool for 10 minutes. 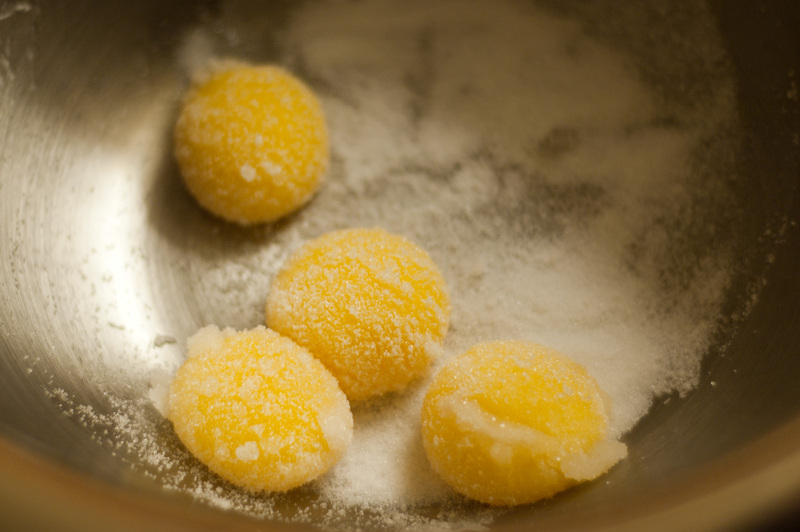 Meanwhile, 4 egg yolks were separated and combined with the sugar and a pinch of salt. 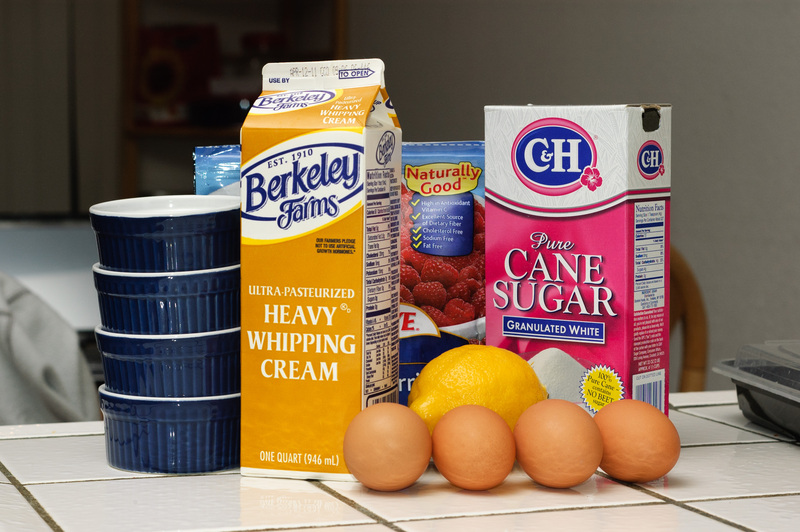 Once thoroughly combined, the now warm lemon-infused heavy cream mixture was added slowly (in order to not cook the egg). 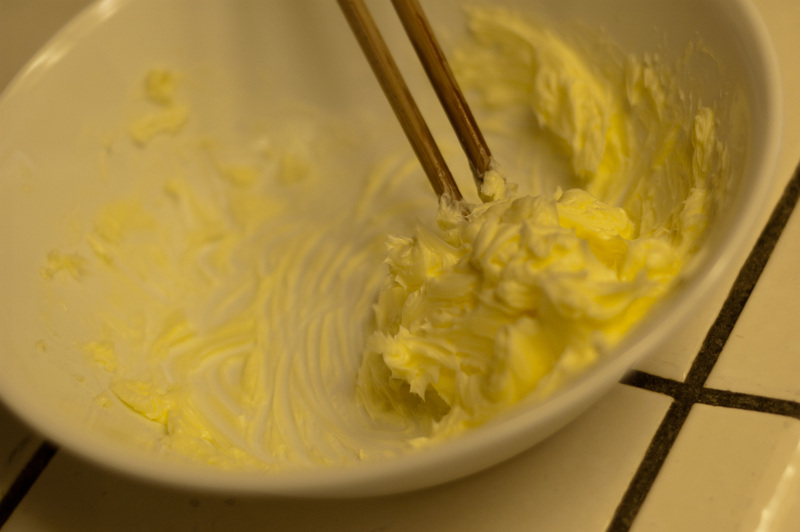 Lastly, the lemon juice was stirred in and the custard was complete. 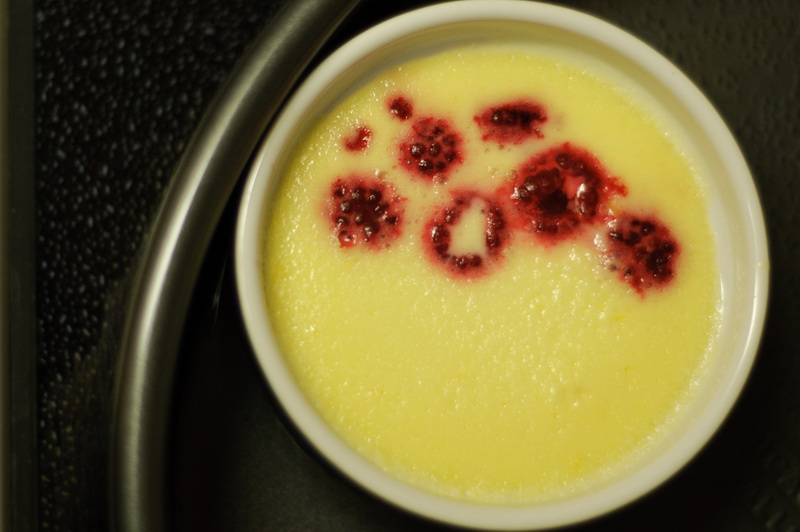 Having preheated the oven to 320 degree F, approximately 6-7 raspberries were allocated to each ramekin and custard was poured on top. Despite the original recipe calling for straining the custard, we figured that the texture of the lemon zest was worth keeping–since it worked so well in a pomegranate gelatin lemon panna cotta that I had tried out before (original recipe here: http://userealbutter.com/2009/02/17/pomegranate-lemon-panna-cotta-recipe ). Anyhow, I digress. Placed the ramekins into pans and filled halfway with almost-boiling water and baked for 30 minutes until just a bit wiggly in the middle. Let cool for a minimum of several hours and top off with sugar, and caramelize with a torch. 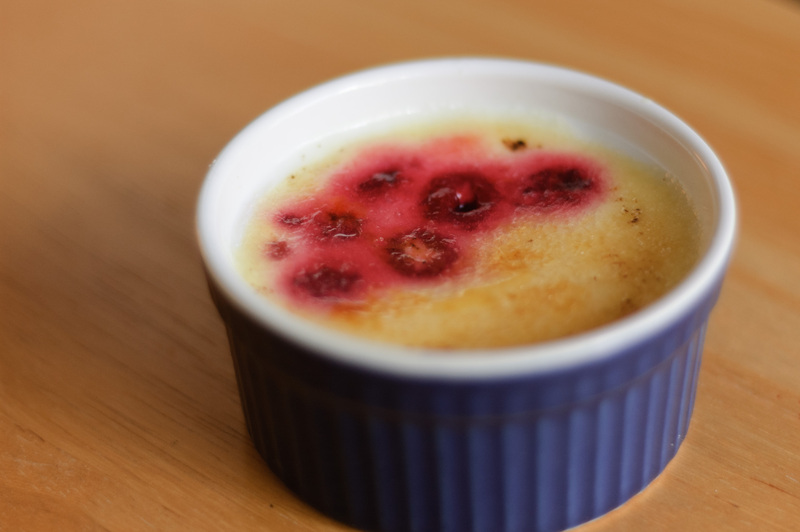 It was the perfect unison of flavors–the tangyness of the raspberry was perfectly complemented by the subtle richness of the lemon custard with the sweet crunch of the toasted caramelized sugar. Absolutely delicious. And not bad to look at either. Enjoy. Salmon Rillette: a spread that I had first experienced whilst enjoying a meal with friends in the New York location of Bouchon Bakery, one of Thomas Keller’s many restaurants that he opened after enjoying the phenomenal success of the French Laundry, a restaurant that garnered numerous international awards and produced innovative chefs that have gone on to achieve similar success such as Grant Achatz of Alinea or Eric Ziebold of CityZen. 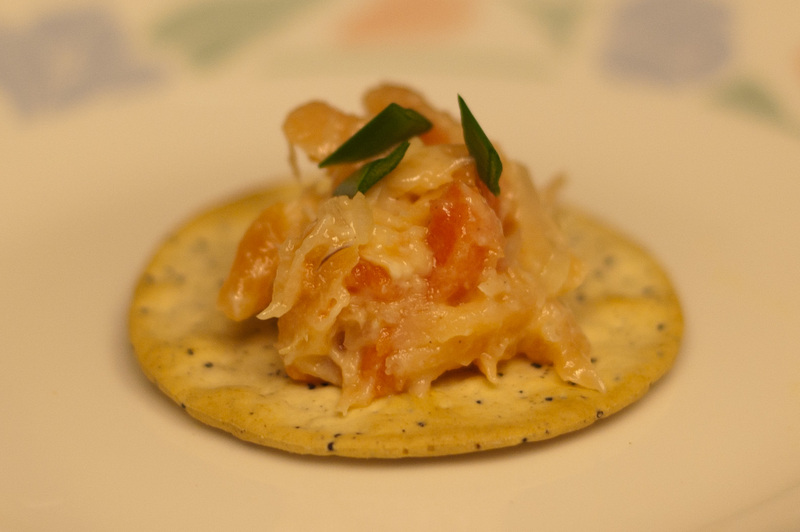 It was a perfect combination of smoked and fresh salmon; several months later, I have finally decided to attempt a recreation as detailed in his book: Bouchon (http://www.amazon.com/Bouchon-Thomas-Keller/dp/1579652395). 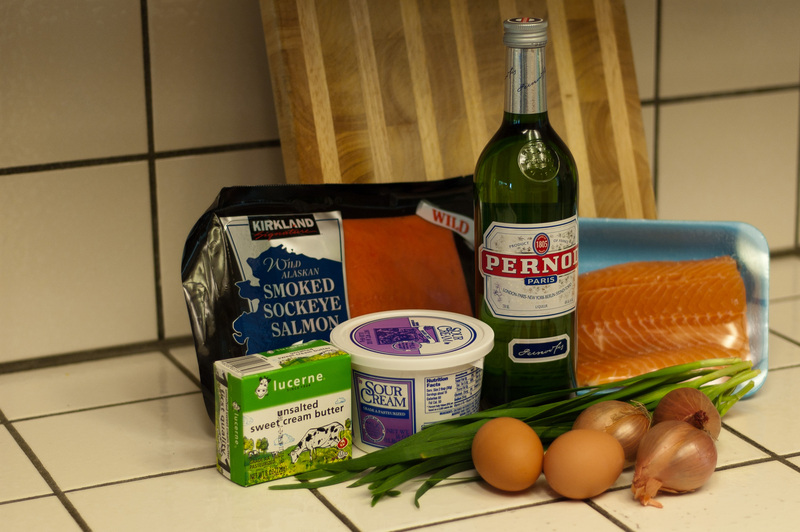 The ingredients: the recipe called quite a few things-fresh salmon, smoked salmon, shallots, chives, butter, creme fraiche, pernod, white pepper, olive oil, and lemon juice. After trekking around to various supermarkets and still unable to find any trace of creme fraiche, I had to settle with sour cream as the closest alternative. Starting off, I skinned the salmon and trimmed off the dark meat as the recipe dictates–the latter I assume was primarily for aesthetic purposes as the darker flesh would look less appealing in the finished product. I marinated the salmon in Pernod, an anise-flavored liqueur, and white pepper for 40 minutes in the fridge–flipping the fillet halfway through. While waiting for the fish to marinate, I used this time to prep the other ingredients. 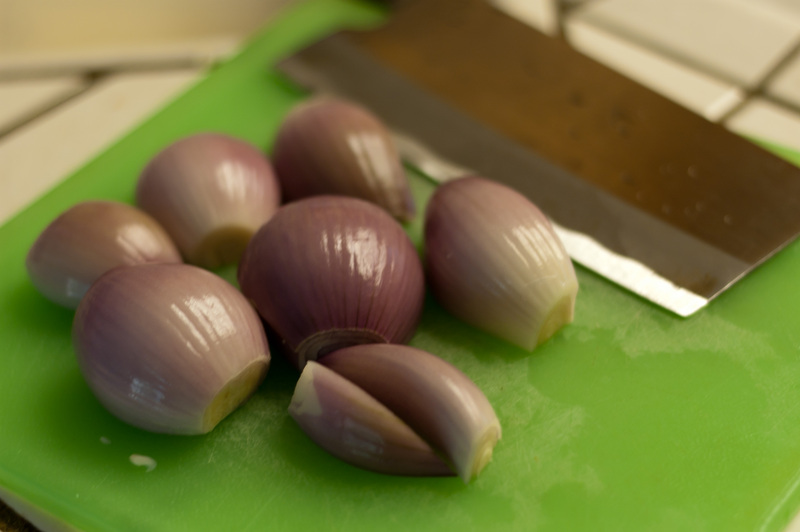 1/2 cup of shallots needed to be minced and sweated with 1 tbs. 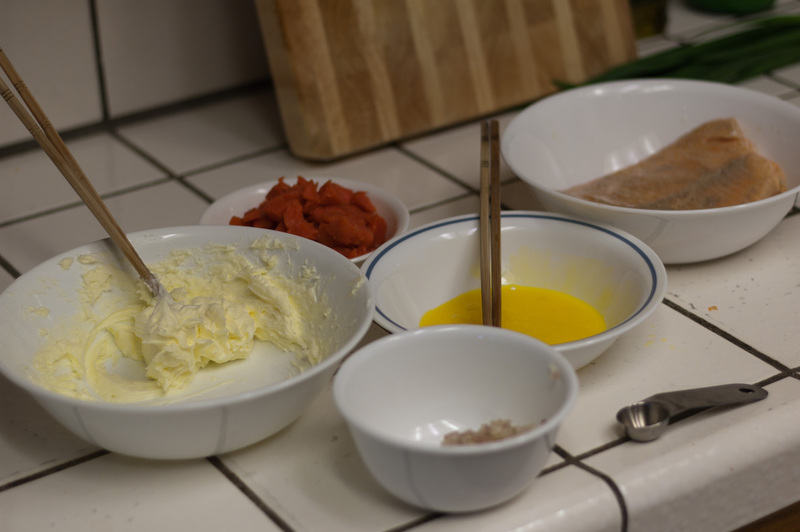 of butter, smoked salmon needed to be trimmed of the dark meat and cut into 1/8″ pieces, two yolks needed to be beaten until slightly lighter, and a stick of butter needed to be whipped and combined with a 1 tbs. of sour cream/creme fraiche [random aside: if you have not seen this episode of SP, I would highly recommend it. http://www.southparkstudios.com/full-episodes/s14e14-creme-fraiche]. 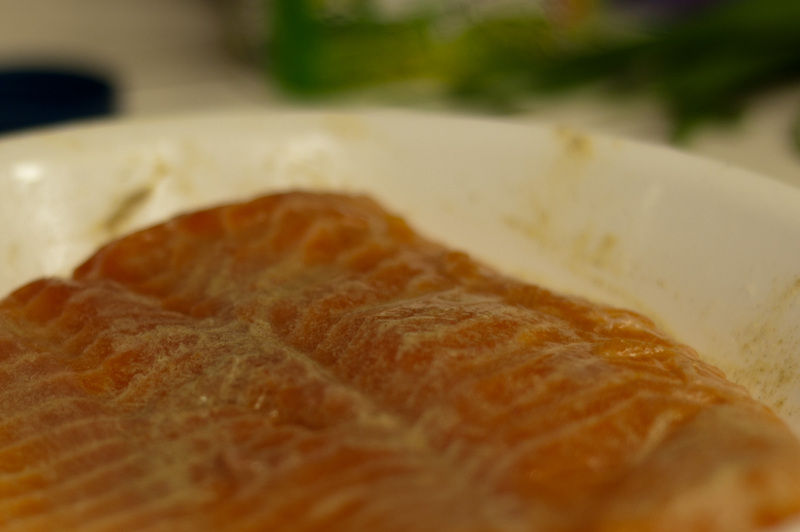 After, I put in the salmon to steam for about 6 minutes until medium rare. In a large bowl after breaking up the salmon in smaller chunks, I combined all the ingredients–and voila, salmon rillette! Unfortunately, the spread will only hold for 2 days–that is unless it is sealed somehow, which calls for clarified butter. 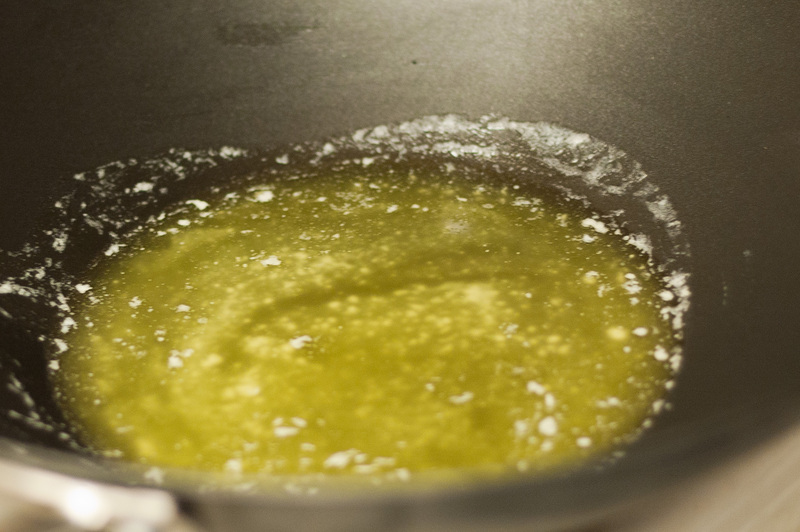 Having never used or made clarified butter, I found the process to be rather simple. 1) Heat up butter (but do not let it brown). 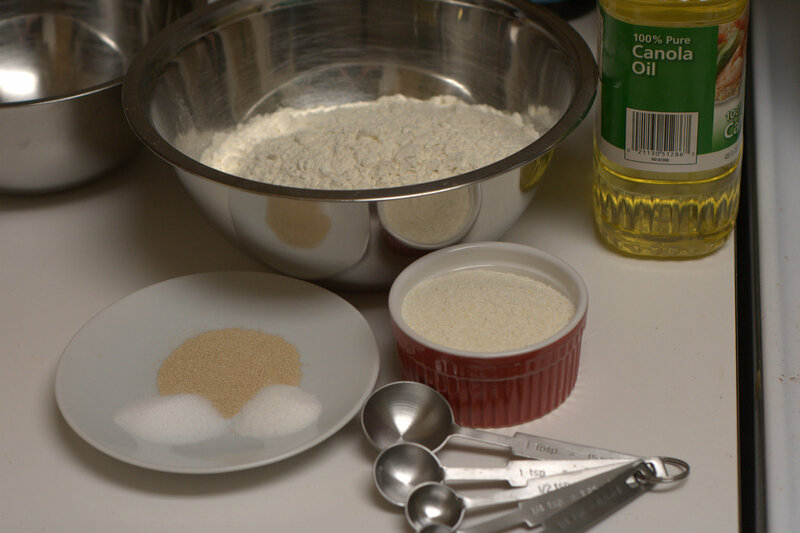 2) Remove from heat and let it cool for 5 minutes and scrape off white foam on top. 3) Carefully pour off liquid. 4) You now have clarified butter. 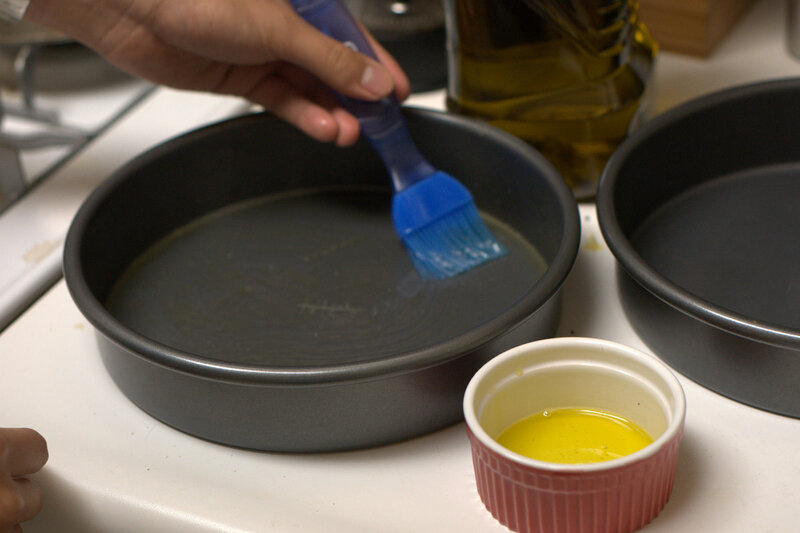 Scoop some salmon and relocate to smaller vessels and pour a good amount of liquid clarified butter over top to seal. 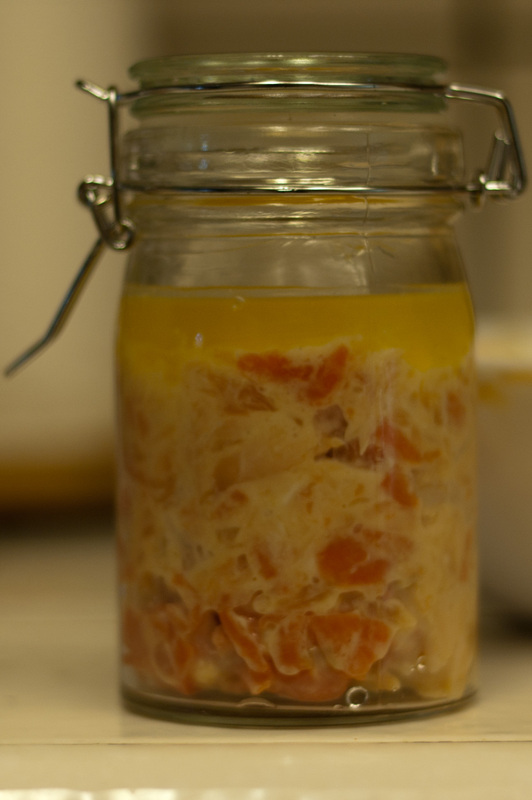 Salmon Rillette should now keep for a week. Salmon Rillette at Bouchon was served on croutons but if you’re lazy like me, water crackers seem to also do the trick. Sprinkle with chives and serve. Enjoy. I think everyone knows what to do if life gives you lemons. But what about a big box of fresh organic blueberries? 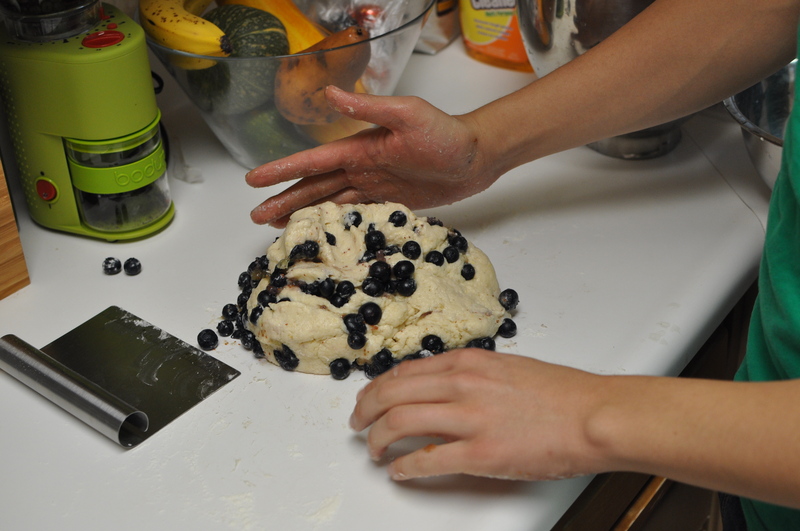 I think the possibilities get much more interesting… With a big box of blueberries in my fridge on the verge of reaching the point of no return and spoiling, Jerry and I decided to take some drastic action and satisfy the hankering for some baking at the same time. 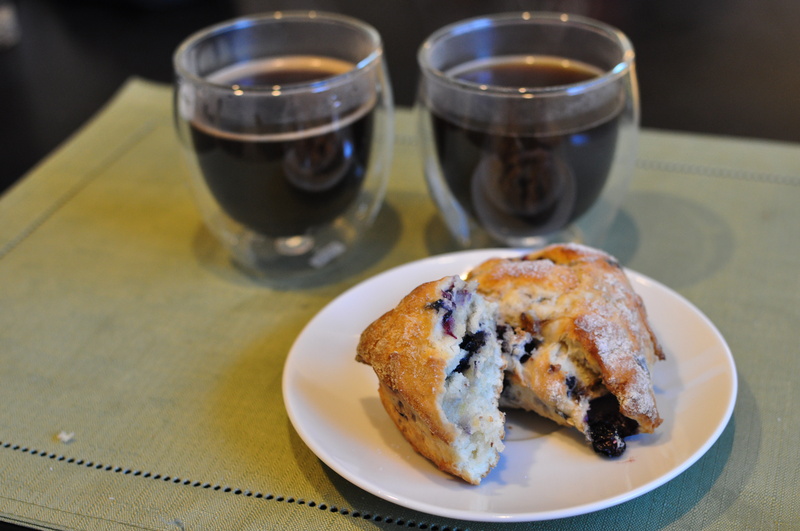 This Lemon & Blueberry Scone recipe found its way to the top of our browsing list while eating lunch at a local Indian restaurant. A quick stop to the shops, and we were ready to get started. 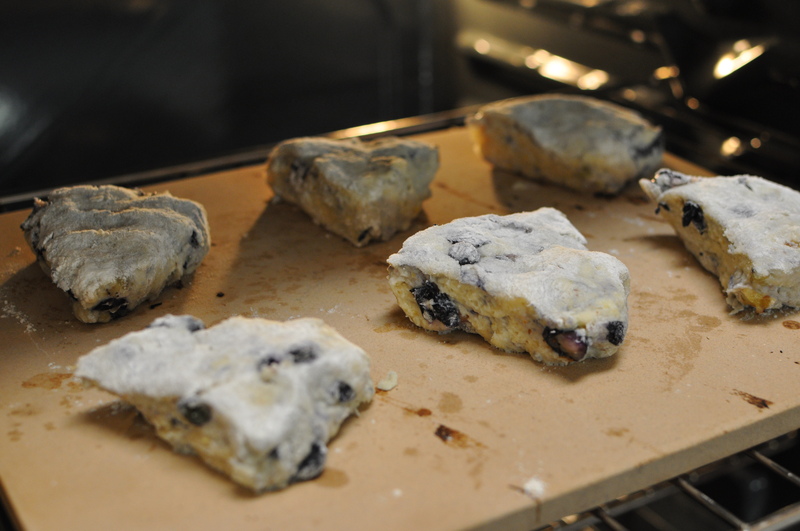 The recipe is fairly straightforward, but we made a mistake in reading the recipe; the orders are for DRIED blueberries, a fact that we overlooked in our excitement. 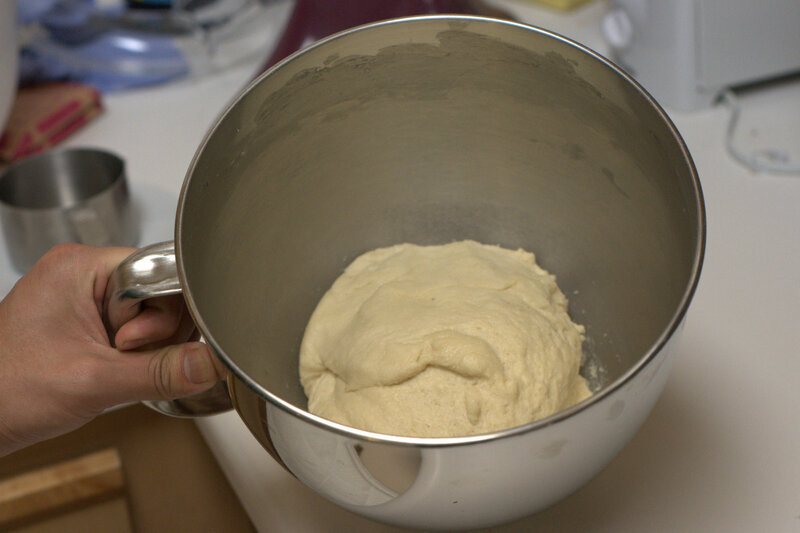 Once we got our ingredients in line, it’s a quick spin in the mixer, and the dough starts coming together. Don’t be shy about the butter! 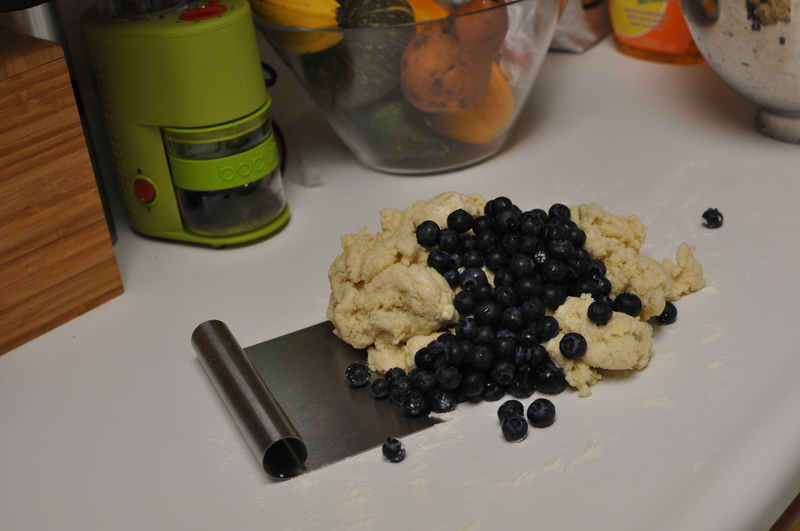 With the wet ingredients incorporated into the dry, it’s time to fold in the blueberries. Happily, sifting some more flour (about 1/3 cup) got things under control, and we were soon shaping approx. 6 inch discs to chop into the delicious wedges. We decided to bake the pastries on my pizza stone to help wick away the steam and pull some of the excess moisture out. Bake for 20-25 minutes; about enough time to watch a nice portion of a Top Gear episode. The rest of the episode can be enjoyed with a freshly baked snack and some smooth French-Pressed coffee. Well, all things must come to an end, and so we return from Summer vacation. Since Jerry has graduated and is now halfway across the country in sunny California, we have decided to start a sort of duel-of-the-blog-posts, wherein we alternate posting things, in a friendly (though competitive) manner. Noone knows how to win, or even what sort of point system there will be, but one thing is sure: deliciousness will follow. Whoops! Amidst all the finals + moving out, we found ourselves a bit preoccupied to put up our latest drink/food creations. But the wait is over! Maciek and I decided to make a break from our usual fare and venture in the category of the champagne cocktail. And of the champagne cocktails, there is no better place to start than the Bellini. 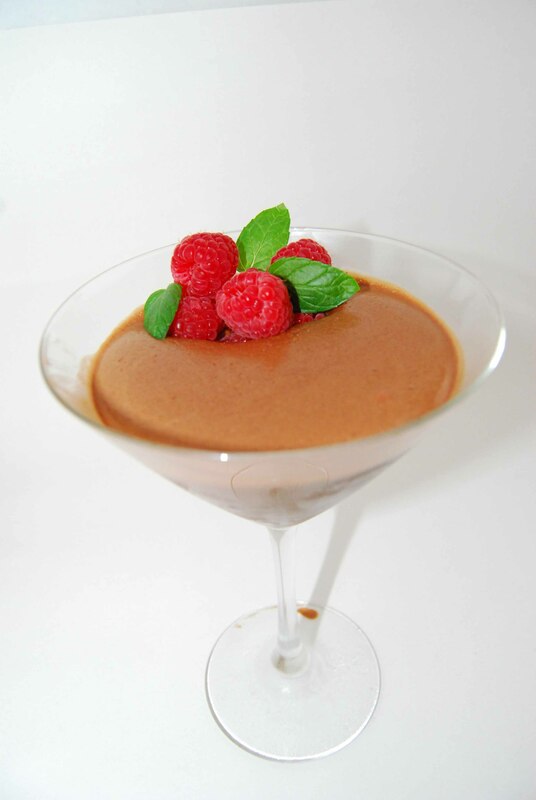 A pretty simple recipe: start off pureeing a peach in a blender/food processor. Chill a champagne glass in the freezer or with ice. Add in the prosecco/champagne, followed by the peach schnapps, peach puree, and a splash of orange bitters. Stir lightly with a spoon/chopstick/anything. 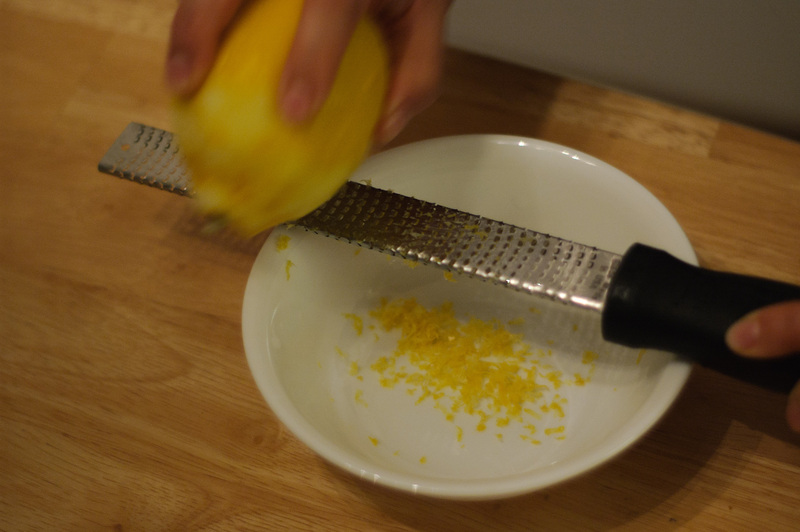 Twist a thin lemon peel over the glass to release essential oils. Garnish and enjoy. 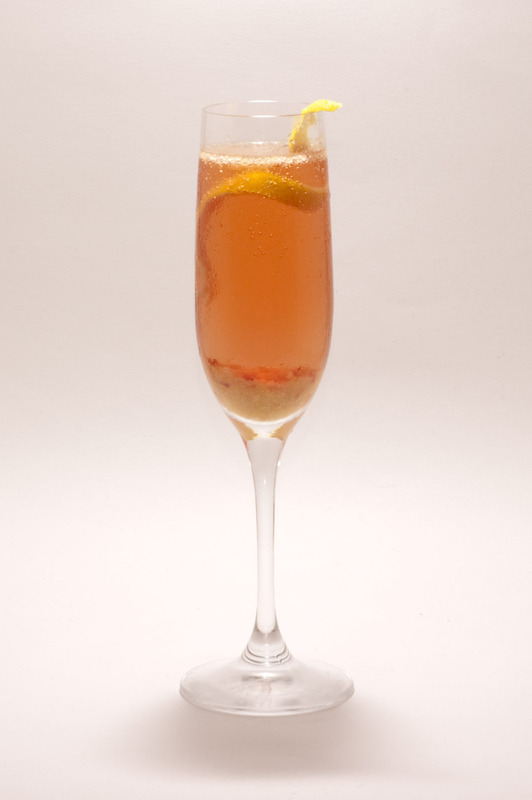 The Bellini is very refreshing drink–peach and sparking white wine do indeed make a good pair. The schnapps served to add a tinge of additional sweetness and the orange bitters give it a slight citrus overtone. Overall, a very drinkable fizzy cocktail and worth trying out. 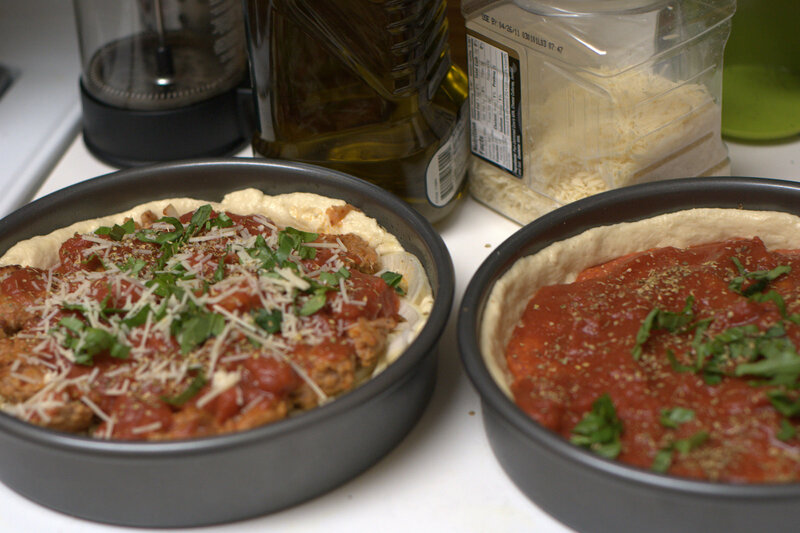 Last Friday, Maciek and I were wondering what to make for dinner and we decided to try out a couple things we had seen on foodgawker a while back. 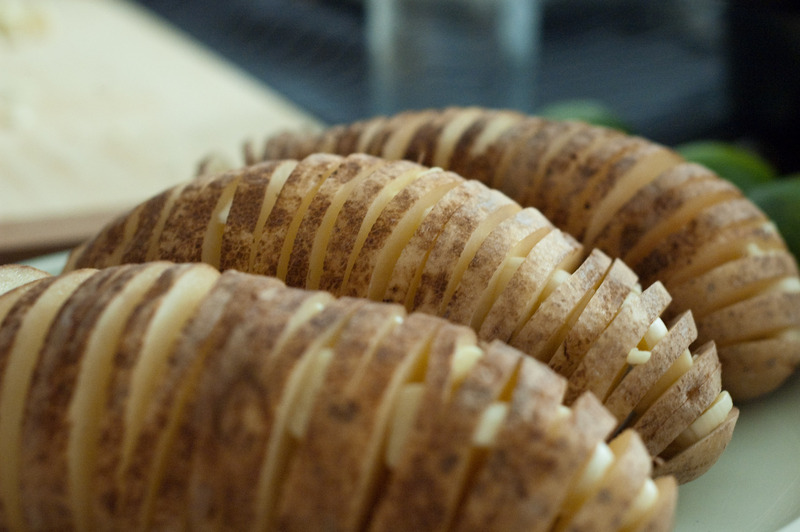 The first part involved Hasselback Potatoes (original recipe here: http://www.seasaltwithfood.com/2009/05/hasselback-potatoes.html). We picked up a couple of large russet potatoes from Jewel and it was time to get to work! 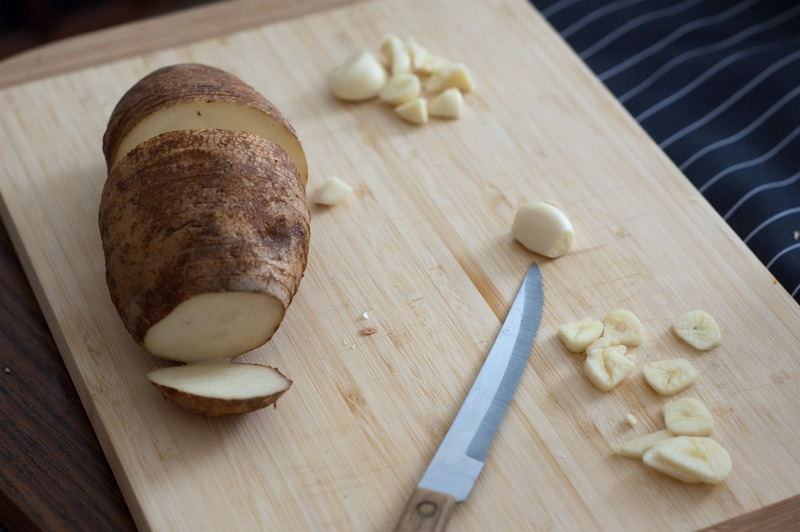 We began slicing our potatoes, taking care to stop about a 1 cm before actually slicing through. 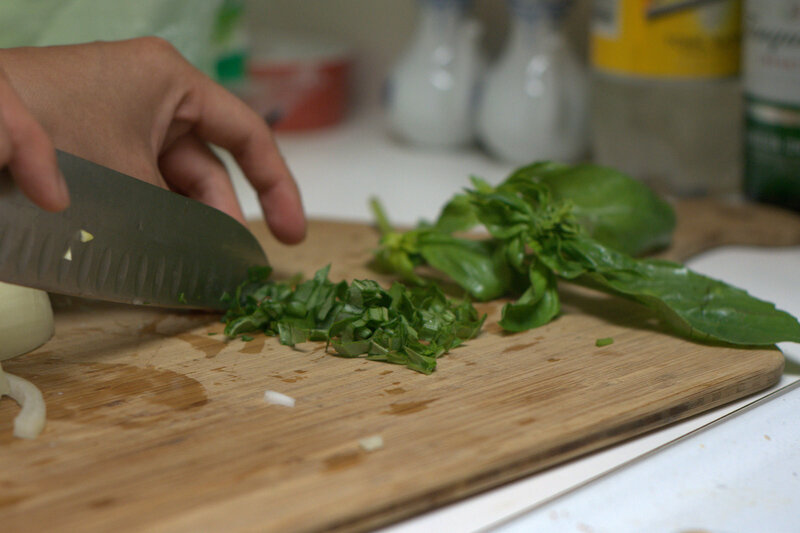 We cut up about 6 cloves of garlic into thin slices which were inserted between the slices of potato. After applying a bit of butter, olive oil, sea salt, freshly ground pepper, and paprika + cumin for a kick, the potatoes were good to go and baked in the oven for about 50 minutes at 450 degrees Fahrenheit. While waiting for the potatoes to cook, we began preparations for the salmon. Seeing how Maciek’s basil plant “Bazzle” was at a healthy size, we decided to try out a baked garlic basil recipe found here: http://allrecipes.com/recipe/baked-salmon-with-basil-and-garlic/detail.aspx. 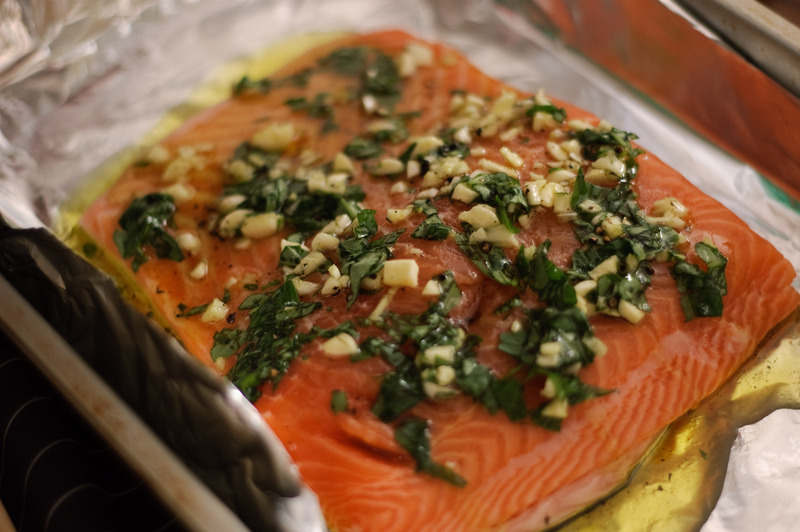 We had bought a nice 1.3 lb Salmon fillet earlier which we laid whole on a baking sheet and added large amounts of olive oil, diced garlic, lemon juice, salt, and ground pepper. We stuck it in the oven along with the potatoes and twenty minutes later, we were ready to feast. 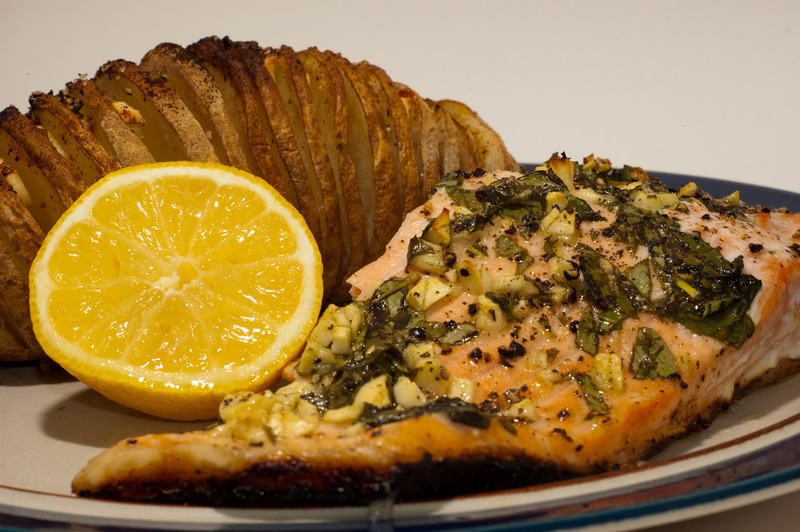 After taking our usual pictures, we feasted–the potatoes were crispy and tender at the same time though perhaps we could have use even more paprika; the salmon was most definitely ‘succulent and juicy’ and incredibly flavorful. Overall, it was pretty fantastic meal and it all came out to be less than $8 for each of us. So much better than dining hall food. Stay tuned for more updates soon. Jerry and Maciek are students at Northwestern University, studying Biology and Computer Engineering, respectively. They are both somewhat obsessed with crafting epic foods and taking stunning photographs, as well as just having a good time.